A truly sophisticated home strikes a careful balance between impressive features and cosy proportions. It is finished with a fine attention to detail and can be equally admired for its sheer beauty and high level of personal comfort. 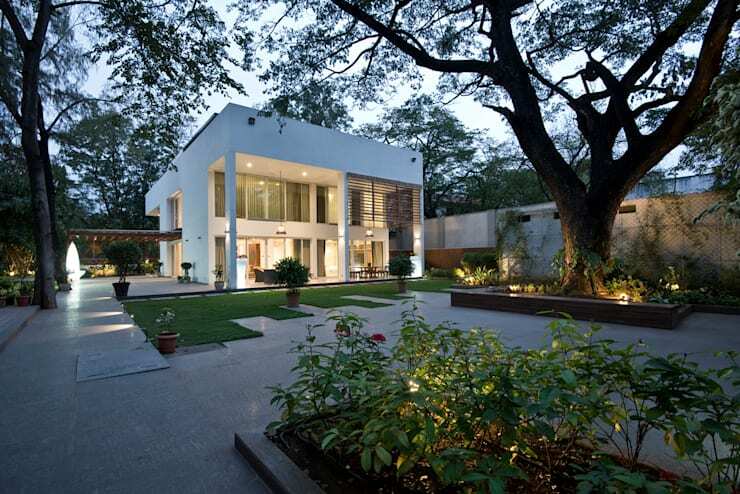 Today we will explore a contemporary Indian home with all the hallmarks of sophistication. 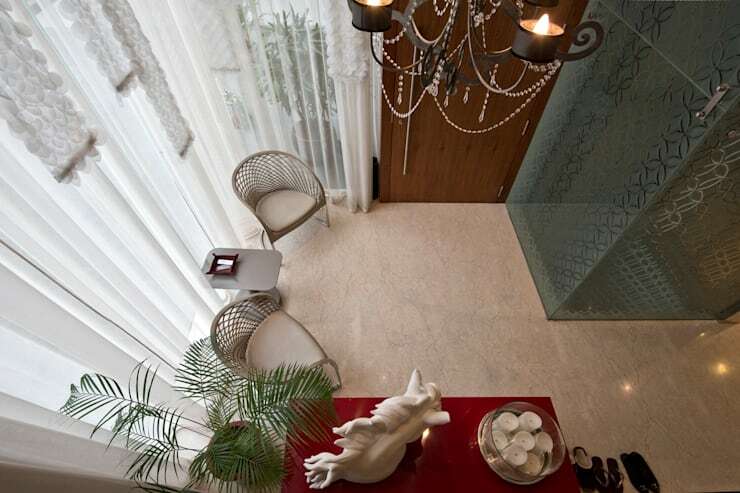 It is located in the exclusive locality of Koregaon Park in Pune. The area is known for its lush surroundings and the home has been set on a block with a large and well-established garden. A truly spectacular piece of design, it is brought to us courtesy of Chaney Architects. Come with us on a photo tour; you're sure to be dazzled! The impressive facade is supported by tall columns and has a broad, flat overhanging roof. The glass walls reach from ground to ceiling level and the ambience is open and welcoming. We will explore the glassed entrance in a moment. But for now, note the delicate balance between the bold white mass and the delicacy of the glass walls and fine lines of the ascending steps. The home has two levels and the rear patio has a bold overhanging roof with a few large columns. This provides a large entertaining area and easy access to the garden. Well-established trees have been retained and give some much-needed shade to the garden. The glass entrance we saw earlier has a double-height ceiling and is almost entirely covered in glass. 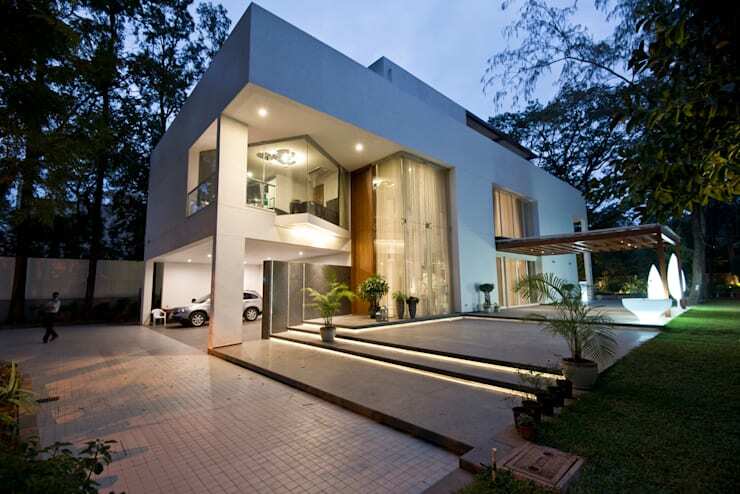 While much of the home is more modestly sized, the entrance is impressive. This part of India can get very hot, so the large sheer white curtains are an important touch! The contemporary home has an open-plan layout. But the L-shaped configuration of the room allows for easy demarcation of the various zones. 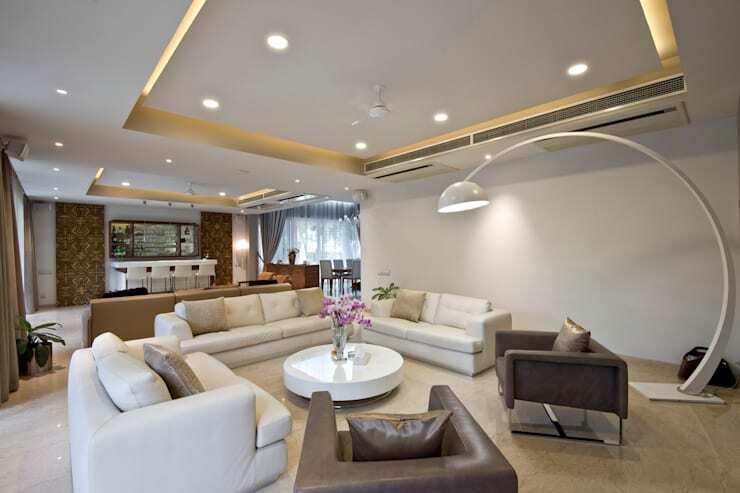 It helps of course that the ceiling of each zone has been recessed to create ambient lights. There is plenty of seating here for guests and it is a simple, sophisticated living room. We love the large white floor lamp! The gracious dining room has all the impressive height and formality of the entrance area. This is fitting for a formal eating area where the owners are likely to entertain guests. The room has an overlooking mezzanine and a large timber staircase. 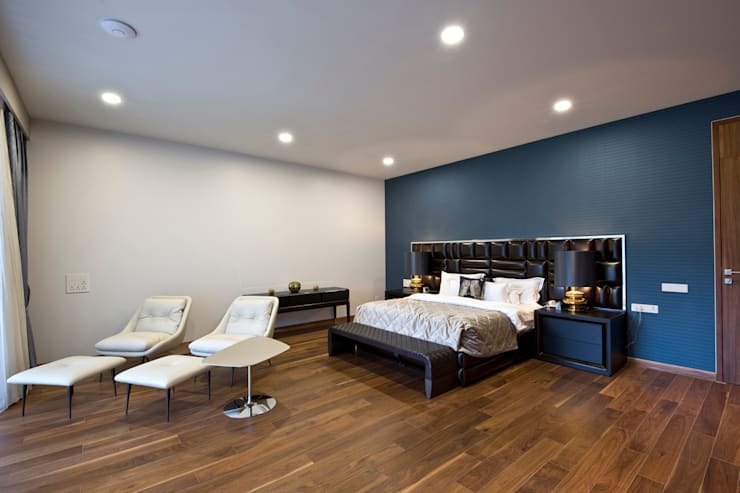 Each of these areas works beautifully together with the help of a very simple decor. The entire area is held together with a series of white tones, translucent glass and timber finishes. But a large and impressive overhanging light makes the dining table the real focus. 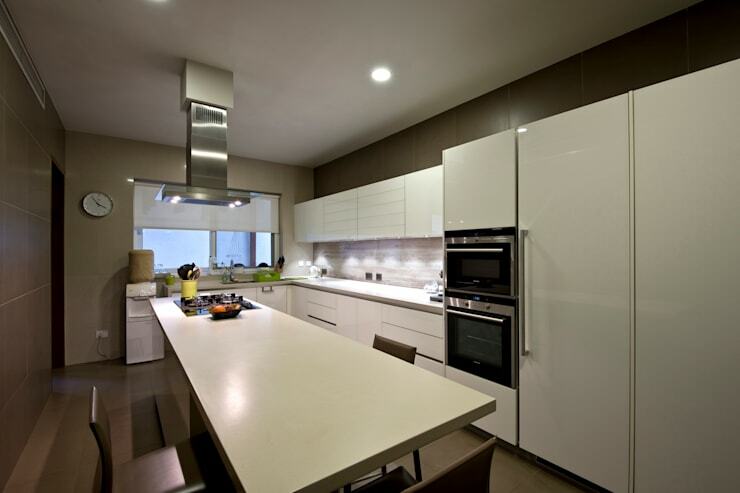 The simple white kitchen has a large kitchen island, handle-less kitchen cupboards and wall ovens. This is clearly a home set up for entertaining and all the features have been generously proportioned. Upstairs we have a bedroom with wooden floors. This makes a change from the polished marble floors on the ground level. The natural timber hues here add a homely touch to the bedroom. It is a large bedroom but the decor has been kept relatively simple. We will finish our tour in the spacious bathroom. It has his-and-hers sinks, a very large wall mirror and sizeable amenities. But it's the careful attention to lighting that really impresses us. 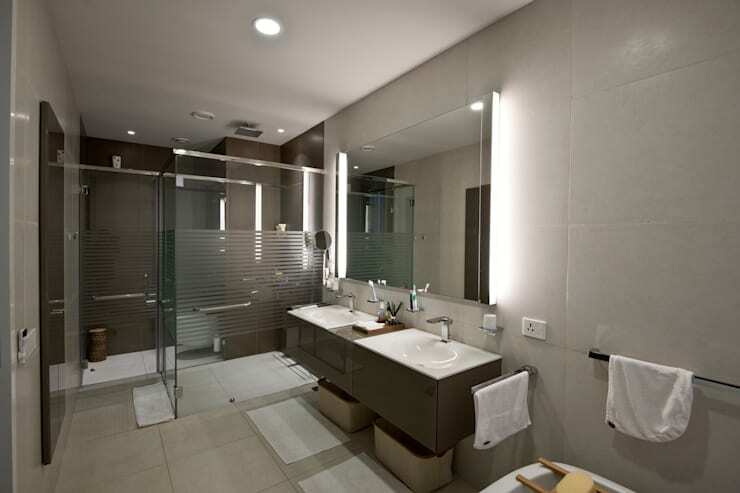 There is soft recessed lighting behind the mirror, recessed ceiling lights and even wall lights in the shower. This is truly a home built for comfort! Luxurious homes can be just as alluring in a big city setting. Check out The secret city home of glass and colour for more architectural indulgence! What is your favourite feature in this lovely home? Let us know in the comments field below!